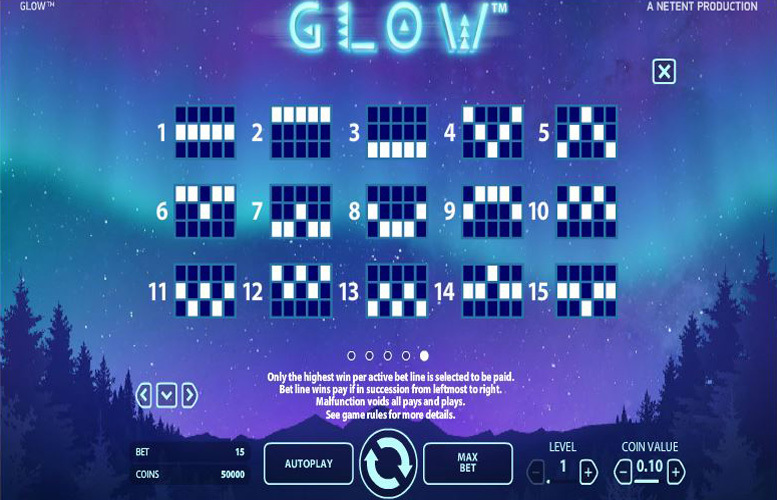 Glow is an attractive and straightforward five reel and three row slot game with 15 pre-set paylines and a theoretical return to player percentage of 96.7%. The Native American style symbols are one of the main draws of a game which also has an impressive top jackpot and exciting additional features such as wild substitutions, free spins and two separate multipliers. If you’re intrigued by the eye-catching and attractive graphics of Glow but don’t know much more about the game, then we’ve got you covered. Below you will find all of the key details regarding the slot’s top jackpot, its special symbols, its paytable and the level of control it offers over a player’s stake amount. 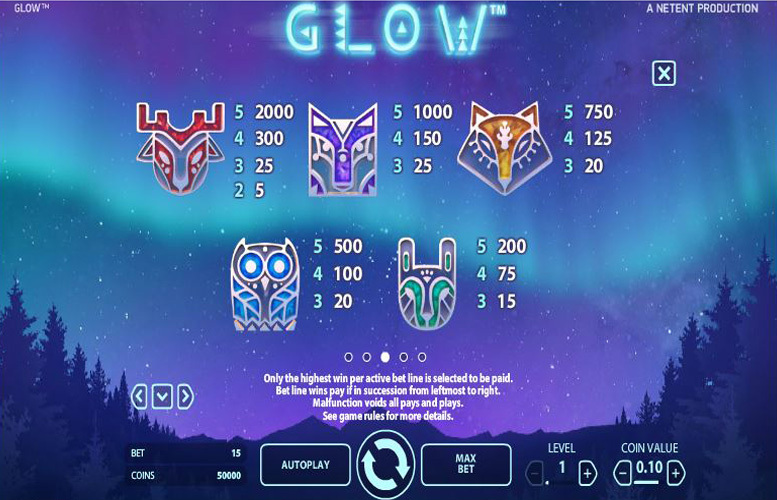 Glow is in many ways a simple and straight forward slots game but does utilise a couple of key special features to provide an impressive top jackpot. The most valuable winning combination within the game is a combination of five of the red stag symbols which pays a jackpot equal to 2000 times the current bet level. That means that at the maximum bet level of ten, that particular combination can award a jackpot of 20,000 coins but that’s not the end of the story. 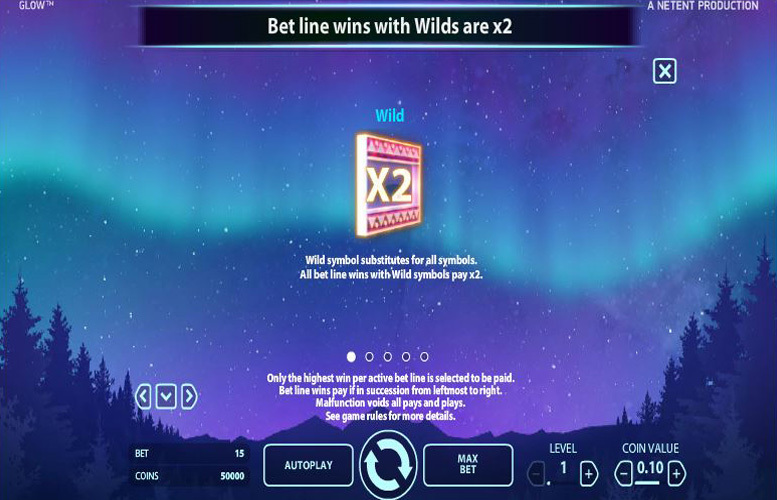 Glow, after all, also includes two separate x2 multipliers which in the right circumstances can be combined to enhance a jackpot by four times. Those circumstances are when the winning combination occurs during free spins and includes a Wild symbol, and in that case if the five red stag combination is achieved, the jackpot equals 80,000 coins. At the highest coin value of £1 therefore, that top jackpot is worth a whopping £80,000. We have already touched upon Glow’s general simplicity and that is further reflected in the fact that there is only one special symbol featured within the game. That is the Wild symbol which can appear anywhere on reels 2, 3 or 4 during both the main game and during free spins and which substitutes for all other symbols. The Wild will always go towards making up the most valuable possible combination for a payline and all wins in Glow which involve Wild symbols have a x2 multiplier applied. Aside from that one special symbol, the other main feature of Glow – beyond the main game – is the free spin option which is available. 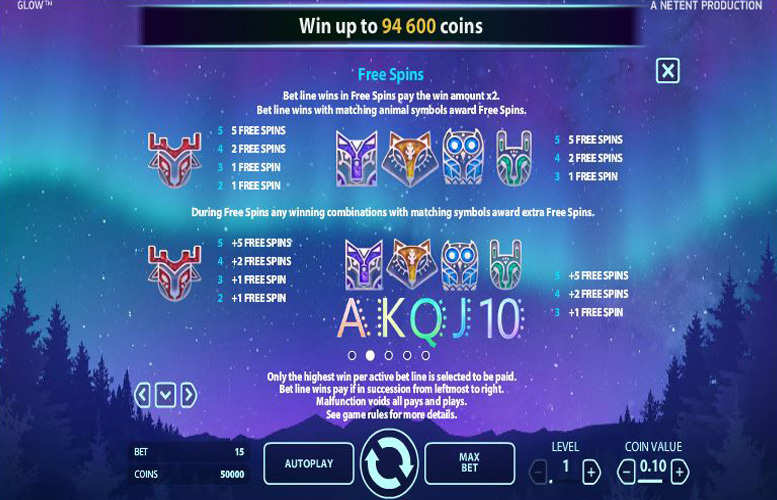 Those free spins are activated when a winning combination includes matching animal symbols and the number of spins earnt depends upon which symbol it is and how many of them are in the combination. The exact numbers are given in the game’s paytable and all free spins are played at the same bet level and coin value as the spin which activated them. Within free spins, all winning combinations have a x2 multiplier applied to them and if a combination includes a Wild symbol, that multiplier will be applied along with the existing x2 Wild multiplier to provide winnings worth four times the standard amount. During free spins too, combinations with matching animal symbols provide additional free spins. The major symbols of Glow are Native American themed animal symbols, and the most valuable of these is the red stag symbol. Five of those symbols in combination along a payline pays out at a rate of 2000 times the current bet level, which at the maximum bet level of ten results in a jackpot of 20,000 coins. That can be increased to 80,000 however, if the combination results from a free spin and includes a Wild symbol, as it would then benefit from both of the game’s x2 multipliers. The next most lucrative symbol within the game is the purple wolf symbol which pays at a rate of 1000 times the bet level and can therefore provide a jackpot of 10,000 coins (or 40,000 if the top multiplier is applied). Glow is a pre-set 15 payline slot which allows players to dictate how much they stake per spin by choosing both the coin value for the spin and the bet level which determines how many coins are wagered per payline. There are ten distinct bet levels from 1-10, each of which adds an extra coin per payline to a player’s bet. There are then seven different available coin values that range from the lowest of 1p to the highest of £1. A minimum stake of 15p can be achieved therefore, by setting bet level one and a coin value of 1p, whilst a maximum of £150 can be staked if bet level ten and a coin value of £1 is chosen. 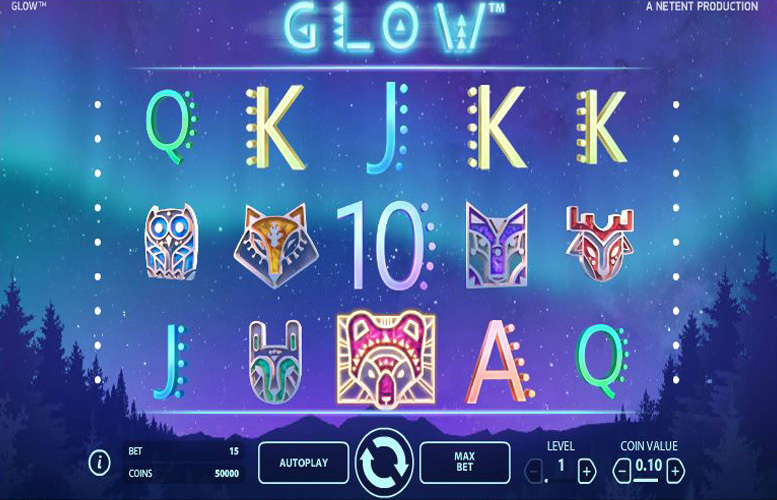 As a slot game, Glow is an option which will appeal to those players who are most swayed by jackpot amounts and do not care much for special features or exciting gameplay. The slot excels when it comes to the generosity of its jackpot, with a top payout worth up to £80,000 possible from its most valuable winning combination. The appearance of the game is also a plus, with attractive and interesting symbols adding to a player’s enjoyment, as is the level of control provided over a player’s stake amount. When it comes to actual gameplay and special features to make that gameplay more interesting and innovative however, Glow falls well behind many other options. For plenty of players though, the potential to win such an impressive jackpot in what is a simple and straight forward manner is more important than the less exciting gameplay.